So… Just how navigable is the channel between Upper Eau Claire Lake, Birch Lake, and Robinson Lake? Here’s the answer, complete with a few photos showing what you can expect. At normal water levels the channels between these three lakes are easily navigable by canoe, kayak, fishing boat, runabout, or pontoon—almost any boat you’re likely to see out on these lakes. 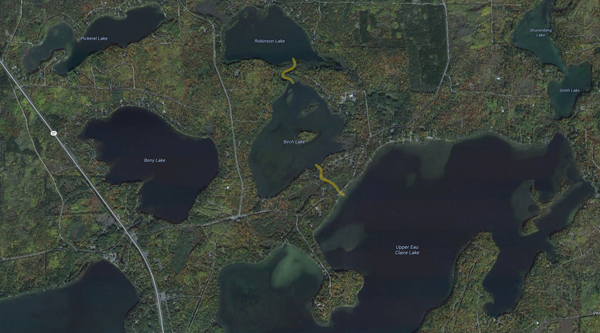 Both channels—the one between Upper Eau Claire Lake and Birch Lake, and the one between Birch Lake and Robinson Lake—are deep enough so you’ll see signs reminding you they’re no-wake zones. But that’s OK. You’ll want to take your time and enjoy the scenery anyway. The first video is the channel between Upper Eau Claire Lake and Birch Lake; the second video is the channel between Birch and Robinson Lakes.